So, when I’m driving for 12 hours, things get kind of random. Here are a few snippets from our drive Tuesday. I’ve been listening to country music for more than 30 years, but Red Solo Cup may be the most redneck song I have ever heard. Bennett: Are we at Arkansas yet? Bennett: Gramma and Papa’s Arkansas? Me: There’s not another one. It was cloudy and story all day. We hit the hard rain right after passing through Birmingham, which still hasn’t recovered from the tornado in April. So, as I’m driving through the pounding rain, I’m praying, watching the road, and scanning the sides of the road to see where the ditches were in case we needed to seek shelter. I was really glad to see the end of the rain. At one point, I did see a round circle in the sky. At first glance, I thought it was the moon because it wasn’t bright. 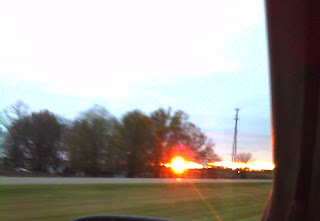 Then I realized that it was the sun behind a cloud. Me: Look! It’s the sun, finally! Jeffrey: Where? Did we pass it already? Me: What? The sun? It’s the big round thing in the sky. Oh, well, never mind. It’s gone now. Jeffrey: Oh, the sun. I thought you said the sign. By the time we finally saw the sun for real, it was setting.